Thursday evening was pretty uneventful. Varen & I started watching House Season 1. Since Bean & I did not have MNET, I missed all the first seasons, but managed to catch a few episodes here & there when back for a visit home in CT. It's a fantastic show and I'm thrilled to be able to catch up on the ones I missed :) Admittedly I did fall asleep half way thru the second one ... oops! On Friday we left work early and headed off for a much deserved weekend away, one Bean & I were supposed to enjoy together. I'd booked it way back when before our relationship came to a crashing halt. Anyway, it was booked and was a place I was dying to go to since I'd first found the website back in 2005 and since I'd paid the deposit, it seemed such a waste to cancel. We arrived at the fantastical Sycamore Avenue in Mooi River at about 7pm that evening. We got our key, dumped our bags in the Bottle Treehouse and headed to the Main House for dinner. Dinner was a little strange, all the occupants of their 5 treehouses sitting round one communal table with nothing in common or to talk about. The food was nice enough ... good home-cooked stuff, but nothing too fancy about it. 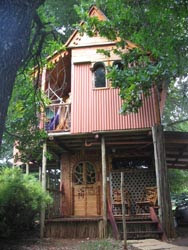 Our treehouse was beautiful and interesting with lots of little quirks around the place (I love the big red leg!). The huge spa bath, the outdoor shower and the hammock chairs on the balcony all made for a fabulous, relaxing weekend. On Saturday after breakfast (Yay, our own table!) we headed off to Bulwer to visit some of my fam (Daddio's side, who were there for a long weekend from Greytown). We spent a nice afternoon catching up with them and enjoyed a brief walk around the only hotel in Bulwer (Mountain Park Hotel) which apparently is pretty much the same as it was 100 years ago. After the visit, Varen & I headed back to Sycamore Ave for a Zulu Dinner (pap & stew and who know's what else!). It was okay, I managed. I'm not a huge fan of pap or anyt sort of mielie derivative, really. Being one of the few South African's who didn't grow up on the stuff (Thanks Mom!). And then there was our first fight. Well, it's silly now in retrospect. And rather interesting too. I caught him out in a silly little lie he'd told me from way back in the day when were were still Just Friends and I was dating Bean. Anyway, he felt stupid for it and handled it by retreating into himself ... and I was annoyed. So there wasn't much communication - see what a problem it can be when you're both stubborn, you'd think I'd be used to it however considering all the ex's. Either way, eventually we had it out properly ... and there wasn't even any yelling :) And then it was off to sleep ... I think B&B accomodation is the maddest thing. You've gone away for a nice relaxing weekend and you have to get up & out of bed and some ridiculously early hour becausethat is when they serve your Breakfast. And it is included in your bill, so you'd better make the most of it ;) Either way, we slipped in at the latest possible still-serving breakfast time of 9:30 (see, ridiculously early for a weekend morning!). And then to top it off, we had to be checked out of there by 10am. What a waste of the last day, really. Oh, I forgot to mention that Dad's birthday gift finally arrived last week, so now I can tell you all what it was. I got him one of these funky new puzzle's he'd heard about called wasgij ... yep, that's jigsaw backwards. And that's basically the aim of the game. It's not so simple as build what you see on the box, you have to build the view from a point in the picture on the box ... so you get s few clues. But basically it's a guessing game till you've finished the puzzle :) Should keep him busy! Anyway. We stopped at a fantastic little Northern Drakensburg restaurant for lunch. 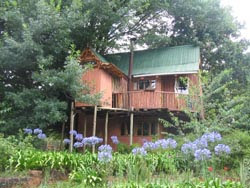 I'd discovered it the first time Bean & I had been to the Drakensburg back in 2005, called the Caterpillar & Catfish Cookhouse. I can't quite explain why I love it, but I do. It's lovely and on Sunday afternoon it was sunn yand we sat outside and listened to live music and ate a good lunch (I had Smoked Trout Salad - really good). And then we were home. We watched 2 more episodes of House and I almost fell asleep again ... I assure you it's not because it's a bad program or anything, it's brilliant and I thoroughly enjoy it, I was just knackered.